The deadline has been extended indefinitely, to a date that will be announced following the release of Euphorius (and in case you haven’t figured it out, this post is teasing that it may be very soon. We are officially in the home stretch. ), because I feel that actually getting it into your hands will be the best way to help you grasp the theme (given that it’s a bit more off the radar than just “dress like you’re going to the dance party at your local pony convention). The Flames of Stone’s Throw have once again, called upon everypony to consider making a trip to its annual Gathering of Embers in the Duskgem Basin just a few hours west of Reino. It’s always an interesting event; it is held in tribute to a famous mare who helped a nearby village escape to shelter in the desert when a tyrant threatened to “bring fire” to them. It has since evolved into an annual event celebrating freedom, self-expression, survival, spirituality, and community, where the light of the flame(s) apparently brings everypony together, and a gigantic effigy representing the Tyrant is set on fire as a grand finale (their logic? Why bring fire to us when we can just bring it to him instead?). The actual tale’s a bit more long-winded, though, and there are many conspiracy theories about what really happened and why this gathering occurs. Of course, the organizers actively deny them. Everyone else (well, especially the younger crowd), however, considers the Gathering to just be a gigantic camping party in a makeshift city in the middle of nowhere, filled with eclectic “art”, everyone dressed up like they’re going to a rave or an Enraged Equines film (or a rave during an Enraged Equines film! ), live music of all kinds, and things being set on or able to blast fire, or otherwise lit up at night, because symbolism. A mare named Blast Furnace, who is the sister of the Gathering’s current leader, enjoys these misconceptions, but has been trying to help educate others on what the event is really about, and how to survive the unpredictable conditions out there. But much like everyone else, she likes a good party! Enough with the backstory! Get to the contest! We’re getting closer and closer to the release of TrotMania Euphorius, which means that it’s time for the part where you get to join in on the fun! In TrotMania III, I began to build a dedicated “universe”, housing mascot characters and plot elements that justify certain design/song choices, and so on. For Euphorius, I’ve been running with the idea and taking it even further – there will be a full-on companion story to go along with Euphorius Its first chapter will be posted very soon, so stay tuned! But now, it’s time to get to the real purpose of this post? You remember that call for OC artwork we did on TM3 for stuff to be featured in its theme (the menu graphics, the results screen backgrounds, etc.)? It was a small, but successful endeavour, so it’s only fair that we’re doing it again! 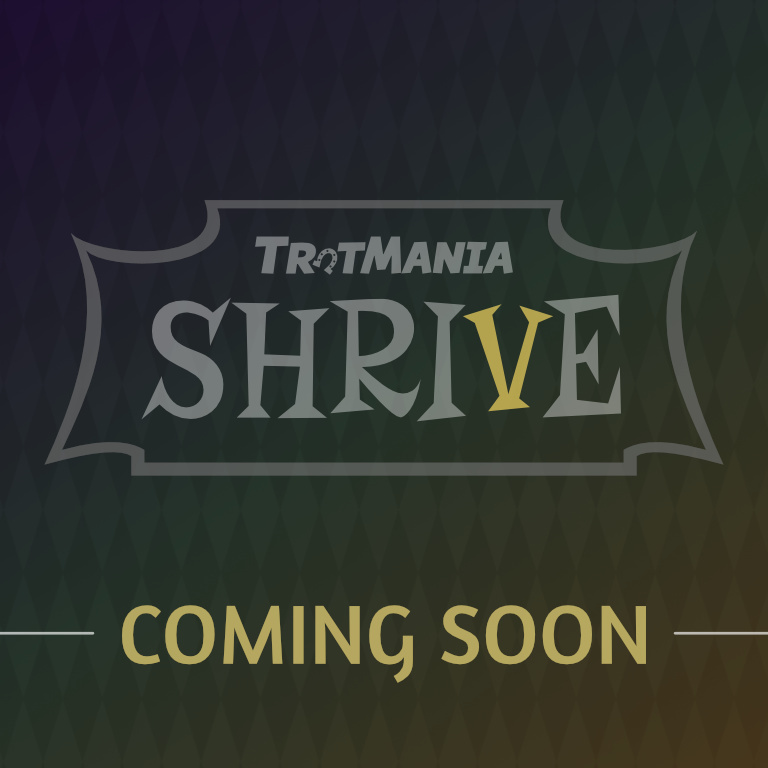 This time, the rewards will be a bit more manageable: all entries will be featured somewhere in TrotMania Euphorius, and the creators of the best artwork submitted as judged by the TrotMania team will receive additional prizes (most likely free pony art from one or more people. Definitely including me, of course). Just like last time, we need art of original characters (either existing ones if you wanna be Horse Famous™, or something new), but this time, given that we actually have a suite of TrotMania characters now too, you’re free to incorporate them as well. The Gathering is, if you haven’t figured it out yet, an homage to a real-life event known as Burning Man (much like the Summer Sun Celebration, in our universe, is a parody of EDC), and how you dress up for something like that is widely-documented (either rave-ish, or more industrial/Borderlands/Mad Max-ish, goggles and masks for sandstorms, etc.). This article can also provide some ideas on what you may need. We prefer for the art to be done in the show/vector style, but we had a new non-show-style entries last time and we managed to make it look good regardless (you’re more likely to get into menus if its show-style). The only rigid requirement is that it has to be a transparent PNG. Entries must be in a transparent PNG format. Art theft will not be tolerated. You may not use bases. Collaborations with a second artist are allowed; if a collab wins, the prizes will be awarded to both of the contributors at once. Keep entries appropriate and safe for work; i.e. no drug use, nothing that would warrant a Questionable tag or higher on Derpibooru, etc. Post the artwork on your preferred outlet (DA, Tumblr, etc.) and link it in the TrotMania character art thread on the forum or in a comment on this post. I will also watch the tag #denizensofduskgem on DA and Tumblr too. The deadline will be some time after Euphorius is released. If you have any questions, don’t be afraid to ask! Feel free to spread the word (we can also take prize donations)!